Sub-millimetre galaxies (SMGs) constitute a population of the most intensely star-forming galaxies and are typically found at in the redshift range corresponding to the peak of the cosmic star formation rate density. To examine this population in detail, Durham has led the largest high-resolution survey to date of SMGs using the Atacama Large Millimeter/Submillimeter Array (ALMA). 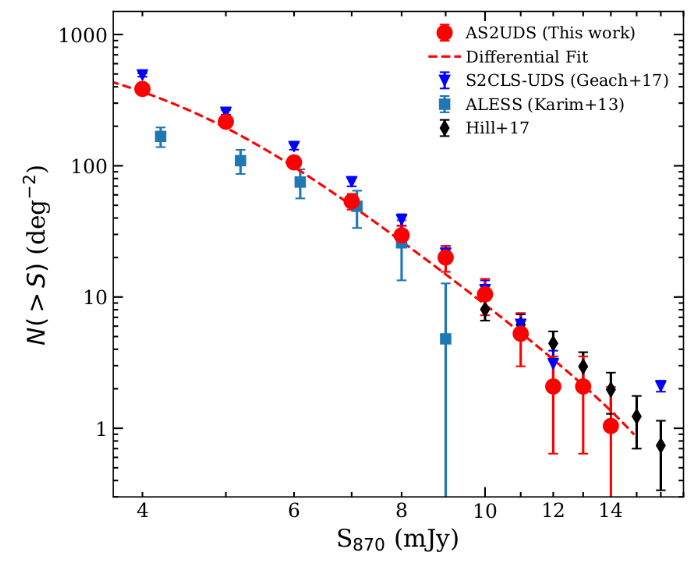 This paper, led by the CEA's Stuart Stach, provides some of the first science results of this 870 micron ALMA survey of 716 single-dish submillimeter sources drawn from the SCUBA-2 Cosmology Legacy Survey map of the UKIDSS UDS field. We constructed resolved differential and cumulative number counts which show a similar shape to the number counts from low resolution single-dish observations, but with a systematically lower normalisation at fixed flux density, by a factor of 1.28±0.02 (shown in the figure). We found a significant fraction of this reduction in the SMG counts is due to the influence of multiplicity, i.e. single-dish sources splitting into two or more SMGs detected by ALMA, with 26% of all single-dish sources brighter than 5 mJy displaying this multiplicity when observed with ALMA. By utilising photometric redshifts we compared the photometric redshift differences between pairs of SMGs in ALMA maps with multiple components to understand the physical nature of this blending. We found evidence that a significant fraction of these pairs are likely to be physically associated, with 30% of all multiple-SMG maps arising from physically associated galaxies.